The Irish economy is growing but quantifying the amount of growth using the National Accounts is difficult because of various distorting effects. This isn’t an item to determine the amount of growth but adds a factor that suggests the growth is positive. The National Roads Authority have traffic counters at numerous locations around the country. The data isn’t the easiest to compile but clicking the green dots on this map provides Adjusted Average Daily Traffic (AADT) figures for 2013 and 2014. The years are not directly comparable (the data only begin in March 2013) but for most of the locations the daily averages are higher in 2014. The site provides more detailed information and the following looks at some of the main arterial routes into Cork City for the first 16 days of the month of December. The eight locations are shown here (click to enlarge). For six of the eight locations daily traffic volumes are up on this time last year. It should be noted that no attempt is made to account for differences between the two years. These could be road works, road improvements, the weather or other factors. There is a noticeable difference between the changes to the weekday and weekend averages with greater increases seen for weekend volumes. Only the N27 (Cork Airport-Kinsale) shows volume decreases on all measures. This may be the result of job losses in the Airport Business Park. In aggregate across the eight locations traffic into and around Cork city is up around 3 per cent on last year. Weekday (or working day) volumes are up 2 per cent and weekend volumes are up 5 per cent. It is hard to know what a 3 per cent increase in traffic volumes means in economic growth terms but at the very least we can say that there is increased activity around Cork. Although not looked at in the same detail, one location on the M50 (Dublin) shows a daily volume increase of 3.7 per cent and a location on the M7 (in Limerick) recorded an increase of 5.7 per cent. It looks like traffic volumes are higher in many locations. The statement accompanying S&P’s upgrade of Irish government debt from A- to A is below the fold – though there is little of note in it bar the indication that a further upgrade is a possibility even though they have put the outlook at stable. There are five more steps back to AAA --- A+, AA-, AA, AA+ and then AAA. The CSO have data on the ‘seasonally adjusted standardised unemployment rate’ back to January 1983. The rate is currently benchmarked to the QNHS and monthly updates are provided using the Live Register. With today’s Live Register data the CSO estimate the rate to be 10.7 per cent. The horizontal red line is the average using all data from 1983 to the present time; the green line is a moving average using the data from 1983 to each month; and the orange line is a 10-year moving average for each period. Here is a chart of the at-risk-of-poverty rate for the population aged under 60 in each of the 28 EU countries. The weighted-average for the EU15 is 17.4 per cent. The highlighted countries are Ireland and Sweden which are both below the EU15 average, though Sweden (7th lowest) is more so than Ireland (16th lowest). The income thresholds used are €14,832 in Sweden and €11,447 in Ireland, though other differences also matter. Here is a table that looks at the at-risk-of-poverty rates (again for those aged under 60) but decomposed by the work intensity of the household. The rates for Ireland and Sweden are again highlighted. The rankings are not inverted! For all work intensity levels, Ireland has a lower at-risk-of-poverty rate than Sweden and in most cases by a very large amount. Ireland has the lowest at-risk-of-poverty rates for people in households with medium and low levels of work intensity. Ireland is only outside the top four for households with very-low work intensity (6th) but the gap to Sweden (27th) is very large. In Ireland 46.7 per cent of people aged under 60 who live in households with very-low work intensity are deemed to be at-risk-of-poverty; in Sweden it is 71.7 per cent and as can be seen this is the second highest in the EU. By work intensity Ireland scores 2, 4, 1, 1, 6 for AROP yet only has the 16th lowest overall rate in the EU. In contrast Sweden scores 14, 24, 16, 25 and 27 and has the 7th lowest overall AROP rate in the EU for people aged under 60. Whatever we may want to copy from Sweden it would not appear that the interaction of their tax and transfer system with work intensity is one of them. Ireland’s tax and transfer system means that households with low and very-low work intensity have a substantially lower at-risk-of-poverty rate then their equivalents in Sweden. The table above suggests that increased progressive income tax and increased transfer payments would have limited impact on the overall at-risk-of-poverty rate. If we artificially apply the Irish AROP rates by work-intensity of the household to the Swedish distribution of the population by the work-intensity of the household the resulting overall AROP rate would be less than six per cent. Obviously, as this indicates the overall rate is determined by the composition of households in each country. Ireland must have a greater proportion of higher-risk households – and we do by some distance. We can see that Sweden has the lowest proportion of medium-, low- and very-low work intensity households in the EU. In contrast Ireland has the third-highest proportion of low work intensity households and the highest proportion of very-low work intensity households in the EU. Again, we can conclude that the composition of household types is different. And it is. Ireland has significantly fewer single-person households and significantly more households with children. Ireland also has more three-adult households. There is considerable noise in Ireland about our at-risk-of-poverty rates (with much of it excluding the first three words of the phrase) and our ranking relative to other countries. Sweden has a lower AROP rate than Ireland but actually understanding why that is so requires a journey that most go beyond tax and transfers yet the debate in Ireland rarely does so. To conclude here is a big table with the at-risk-of-poverty rates by household types shown in the previous table. Click to enlarge. Unsurprisingly, Ireland performs worse than Sweden for almost all household types. This is likely a function of the work-intensity figures shown earlier. Ireland performs significantly better for one-person aged over 65 households (16.3 per cent versus 36.7 per cent) and marginally better for single parent households (31.1 per cent versus 33.3 per cent). For all other household types Ireland underperforms Sweden. A final note on the above table is that Ireland has a lower at-risk-of-poverty rate than the EU15 average for all household types with children. When deprivation is counted as a household experiencing four or more of this items Ireland fares badly. Only Italy and Greece of the EU15 have higher rates. The following table tries to provide the detail behind the topline figures by ranking EU countries for each of the individual deprivation items. Click to enlarge. The increases in the last three measures listed above evident. The number of households reporting an enforced lack of a private car fell five percentage points over the decade (13 per cent to 8 per cent). The number of household reporting an inability to keep home adequately warm rose five percentage points (3.2 per cent to 8.5 per cent) with all of the increase happening since 2008. Here is the same chart showing the averages for the EU15 (data for 2003 and 2004 are not available which the 2013 figures are estimates). The large increases in households in arrears, being unable to face unexpected expenses or afford a one-week holiday away from home as evident in Ireland are not seen in the EU15 data. It is these items that is driving the difference between Irish and EU15 deprivations rates in recent years. Here are some slides from a presentation on the recent performance on the Irish economy: statistical recovery or real recovery? When the Q2 QNAs were published back in September they were meet with wide acclaim. The headline figures looked very impressive. The annual growth rates (percentage change over the same quarter in the previous years) are impressive. GDP in the second quarter of 2014 was 7.7 per cent greater than the equivalent quarter of 2013. But as was quickly pointed out that while the headline performance might be good “under the hood” things were not all what they seemed to be. First we can try to decompose the growth into “net exports” and “domestic demand”. As an aside it is worth noting two things about the above chart though neither is likely to have a substantial impact. It doesn’t show the impact for changes in stocks. Net exports or domestic demand could rise but if some of this comes from existing stocks the effect on overall GDP will be lower. The CSO would not produce a chart such as the above because the individual series from which the above contributions to overall GDP growth are derived are not additive. The series are chain-linked individually into constant prices. These aside we can see that the growth in Q2 2014, in annual terms, was pretty evenly divided between net exports and domestic demand. If we now break net exports into its constituent parts we see that exports shot up hugely in the first have of 2014. What are we selling more of? On the services side little is evident. Both have increased but not unusually so. However, if we look at trade in good we see this. Goods exports in the national accounts have gone vertical! And there has been no offsetting increase in good imports. So what are we making lots more of that we are exporting? The CSO’s Trade Statistics show merchandise exports from Ireland and they should reflect the massive increase in exports in the QNA and show us what category the additional exports are coming from. But as we now know they don’t. Here is a comparison of quarterly goods exports as reported in the Trade Statistics and as recorded in the National Accounts. For comparison purposes both are in current prices. The increase in goods exports in the QNA does not appear in the trade statistics. It is due to “contract manufacturing”. Manufacturing that is organised by an Irish resident company but happens somewhere else. However, because the risk is with the Irish-resident company part of the value appears in the Irish national accounts. Yet another MNC effect to muddy the waters. The conclusion was that there is growth but that perceptible rather than statistical growth is limited to the blue part of the final bar in bar chart above. We will turn to that next. Here is a piece carried by today’s Irish Examiner on the funding of public expenditure on water. It is based on a recent post - ‘how much do we spend on water?’. The unedited text for the piece is reproduced here. In 2012 public expenditure on water in Ireland was €1.5 billion. This money is being spent on a system that does not work. The ongoing protests about water charges fails to understand the key point – it is not about paying for water; it is about paying for the infrastructure to deliver clean water and treat waste water. Over the past ten years the government has spent €18 billion on water. Of this, only 10 per cent was to pay for the actual supply of water to households and businesses. An emphasis on conservation can only save money on this small portion of the expenditure. The other 90 per cent of expenditure is unaffected by the amount of water we use. It costs about twice as much to manage and treat waste water and sewage as it does to provide clean water. A further 30 per cent of water expenditure over the past decade was consumed by staff costs. The remaining 40 per cent was devoted to investment in the water and waste water infrastructure. This is the largest component of expenditure on water and the most important. The most significant austerity measure introduced in relation to water since 2008 is not the botched introduction of domestic water charges – it has been the slashing of investment in our water infrastructure. Since 2008 capital spending on water has been cut by over 60 per cent. In 2008, the government provided €1 billion for investment in the public water system. The same year the ESB also provided €1 billion for investment in the electricity system. In 2012, the ESB’s capital expenditure was close to €800 million while public capital expenditure on water was cut to just €375 million. As a semi-state company the ESB can leverage its revenues to borrow money to fund its investment. As a commercial enterprise the ESB’s management can take a long-run perspective. On the other hand, expenditure on water was part of general government expenditure and the huge cuts to public investment in water were introduced to meet short-term deficit targets and avoid adjustments elsewhere. Huge expenditure is needed to bring our water network up to scratch but it is not clear where the money will come from. The government remains under pressure to reduce the deficit and the size of the public debt limits the government’s capacity to borrow even though interest rates are at historical lows. A public utility can raise the funds and its management can look beyond short-termism or the election cycle. Investment in water and sewage infrastructure does not have political attractions. It is disruptive, underground and offers little opportunity for ribbon cutting. Although they have been on the agenda for years, water charges were rushed in by the current government because they wanted to get them in the rear-view mirror well before the 2016 election. The charges were over complicated politically-motivated add-ons such as allowances which required PPS numbers to be administrated correctly. If the politicians wanted to compensate people for the introduction of water charges it should have been done through the existing tax and transfer system. This would have been possible in last month’s budget which had a €1 billion package of tax cuts and expenditure increases but a lack of joined-up thinking resulted in a failure to get a coherent message across. Now we have a further complication with the €100 water conservation grant. This is just further pointless administration. The government want to cap water charges at €160 per household but because Irish Water must get more than half of its revenue from private sources households will actually pay €260 to Irish Water and receive €100 back from the Department of Social Protection. The government met major difficulties a few years following the introduction of the €100 household charge; now they are giving €100 to households to try and solve the mess made of water charges. To avoid been deemed as a subsidy to Irish Water the €100 will be paid to all households. So instead of collecting money off those on the public system we now have reached a point where we are subsidising those on private water schemes who paid for their own water up to now. Ireland has a history of introducing measures with names that do not reflect their actual design. For example, we have the respite care grant and the public sector pension levy. This measures have their merits but their implementation has nothing to do with respite care or public sector pensions. They are a transfer payment and a pay cut. There are many items on this list to which we can now add water charges and the water conservation grant. These have nothing got to do with using or conserving water. The principles of taxation are equity, efficiency, certainty and ease of administration. The charges announced this week fail on three of these principles. Both the charge and offsetting grant are at a fixed rate so are regressive. The fixed charge means that there are no efficiency gains from conservation and the fact that households have to pay €260 to Irish Water to get €100 back from the Department of Social Protection only adds to the unnecessary bureaucracy of our system. It is a little ironic that the outcome of the protests of the past few weeks has resulted in charges that are regressive and inefficient. We should have water charges based on use but not necessarily because we need to conserve water. Conserving water is helpful but it is not as if like we are going to run out of it. It actually does fall out of the sky. It is better management of the plentiful supply we have that we need. Better management can be achieved by metering but the benefit of this will be in identifying leaks and unreasonable usage rather than in getting typical households to control their usage. Universal metering is unlikely to being significant benefits. The introduction of metering is to link charges with usage of water but we must have a utility that can adequately fund the 90 per cent of expenditure that is on top of the cost of the actual water. Many of those protesting want the abolition of Irish Water. A utility company for water is exactly what we need. The system that resulted in the broken water network we have now must be dismantled. Is Ireland running a primary surplus? A bit esoteric but probably not. The Economic and Fiscal Outlook released with last month’s budget shows that a small primary surplus is expected for 2014. The primary balance is the balance when interest expenditure is omitted. This is shown in the following table in item 18. The overall deficit is expected to be just below €7 billion and because interest expenditure is almost €7.5 billion, a small primary surplus results. It is supposed to be a measure of the fiscal position once debt servicing costs are excluded, i.e. is government revenue sufficient to cover all non-debt related expenditure. The above table suggests this is the case. However, there has been lots of circularity in the public finances over the past few years with money moving between entities (the Exchequer, the NPRF, Nama, the IBRC and the Central Bank) and hence in and out of the definition of the “general government sector” under Eurostat rules. The NPRF and the IBRC are within the general government sector while NAMA and the Central Bank are not. As a result of the Anglo bailout and the Promissory Note bond swap the Central Bank holds around €28 billion of Irish government bonds (it was originally €28.5 billion but €0.5 billion have been sold.) These bonds will see around €900 million of interest paid to the Central Bank during 2014 with around €750 million coming the Floating Rate Notes and €150 million from the 5.4 per coupon 2025 bond. A large part of this is repaid back to the Exchequer Account and is counted as Revenue in the above table. Because of this cross-holding in the broader government sector the primary balance can appear different with no actual change at all. For example, if the interest on the bonds held by the Central Bank was to increase to €2 billion. This would increase interest expenditure by €1 billion and also see revenue increase by €1 billion when the Central Bank surplus is paid to the Exchequer. The overall balance would be unchanged. However, the primary balance would show a €1 billion improvement as the one €1 billion increase in interest would be excluded when calculating the primary balance but the €1 billion increase in revenue from the Central Bank surplus would be included. This is not how the primary balance should change as it is supposed to be unaffected by interest changes. So with a reported primary surplus of €575 million and around €900 million of interest being paid to the Central Bank and flowing back to the Exchequer it can be seen that the primary surplus is somewhat notional. This would be revealed if the Central Bank was to sell the bonds it holds meaning that the interest payments would not be recycled back to the Exchequer. Alternatively, the primary surplus would disappear if the interest paid on the bonds held by the Central Bank was nil. Excluding these circular interest payments between the Exchequer and the Central Bank, government revenue is still not sufficient to cover non-debt related expenditure. It should happen in 2015. How much do we spend on water? Two-thirds of the expenditure relates to the management of waste water and one-third to water supply. One-sixth of the total relates to the intermediate consumption involved in actually supplying water (€250 million). Here is a table with the same data for the decade from 2003 to 2012. Click to enlarge. Over the decade the government spent €18 billion on water services. The intermediate consumption of actually supplying water is 11 per cent of the total (€1,981 million out of €18,057 million). The element showing the greatest variation over the years is gross capital formation (investment in infrastructure). This was around €600 million in 2003, rose to €1,100 million in 2007 and was reduced to less than €400 million in 2012. In financial terms, the most significant austerity measure in relation to water is not the introduction of domestic water charges; it has been the slashing of capital expenditure on water infrastructure. This has short-term benefits for the deficit but the money will have to be spent at some stage. Here is a comparison of public capital expenditure on water (funded directly by the government) and on public capital expenditure on electricity (funded indirectly by the ESB). No value for money judgements are implied. The table does not include private capital expenditure and there have extensive subsidies and incentives for private capital expenditure in electricity (wind farms etc.) in recent years. It also excludes private capital expenditure on water by the many not connected to the public water system. In 2008, public capital expenditure in the two areas was almost identical. By 2012, public capital expenditure on water had been cut by 65 per cent and was almost 50 per cent below its 10-year average of €716 million. Capital expenditure by the ESB was also reduced but was 20 per cent below its 10-year average of €966 million. The cuts to capital expenditure on directly funded water services were far greater than those to capital expenditure on indirectly funded electricity services. This was done mainly to achieve deficit reduction targets. The water charges debate has focussed on the cost of the water that comes out of the taps. For the past ten years that has been about 10 per cent of the cost of public water services. We need to make sure we can fund the other 90 per cent. The most significant announcement on Corporation Tax in the recent budget was the planned introduction of a ‘knowledge development box’. The changes to the residency rules under the heading of the “double-irish” will be ineffective in changing tax outcomes and the profits, as well as the low-tax outcomes, will remain offshore. A blind-eye could not be turned if similar low-tax outcomes were achieved using an onshore ‘knowledge development box’. In the Financial Statement the Minister for Finance said “I plan to legislate for it in next year’s Finance Bill or as soon as EU and OECD discussions conclude.” A significant element of these discussion is this joint Germany-UK statement on patent boxes. It is not clear what impact this will have on Ireland. The Minister for Finance’s intention that “the Knowledge Development Box will be best in class and at a low competitive and sustainable tax rate” is a relative concept. When trying to examine this it worthwhile to look at the level of R&D expenditure in Ireland. The most significant change in ESA2010 is the reclassification of R&D expenditure. In essence it has been moved from intermediate consumption to capital investment. The revised NIE accounts provide figures on GFCF (Gross Fixed Capital Formation) in R&D back to 1995. The six per cent rise in the level nominal GDP arising from the introduction of ESA2010 is almost entirely due the capitalisation of R&D expenditure as the CSO explain here. The estimate of 2013 nominal GDP was revised from €164 billion under ESA95 to €175 billion when ESA2010 was applied. While there is a huge amount of R&D expenditure in Ireland (€7 billion in 2013) but there is little evidence of activity resulting from it. The reason for this is that most R&D in Ireland is imported. The expenditure comes from Ireland but the activity takes place somewhere else. We can see this in the Balance of Payments where R&D imports are recorded (payments made from Ireland to pay for R&D activity elsewhere). International standards for the collection of Balance of Payments data have also being revised and the CSO have moved from applying BPM5 (Balance of Payments Manual) to BPM6. For that reason we get two measures in the following chart as the CSO have not published revised historical data using BPM6. The main difference for R&D in BPM6 is that outright purchases of patents are now included in the current account whereas under BPM5 such transactions were in the capital account. The €2 billion difference between the BPM5 and BPM6 R&D imports figures for 2012 is due to a large acquisition of a patent by an Irish-resident company. There is also a small amount of R&D exports from Ireland and this series seems relatively unaffected by the change from BPM5 to BPM6. It is the net amount between exports (R&D assets going out) and imports (R&D assets coming in) that contributes to gross fixed capital formation (GFCF). The following table gives a breakdown of the R&D component of GFCF shown in the first chart for the past four years (all figures in €millions). An agreement between two parties to share the cost of developing an intangible asset, such as computer code, production methods, or patents. Such an arrangement is used to reduce or avoid taxes on the transfer of assets. For example, if a parent company wanted a foreign subsidiary to use one of its patents, tax authorities might consider the transfer a taxable transaction. By establishing a cost sharing agreement, the parent company and the subsidiary share in the cost of developing the patent, so that both are entitled to use it, and it is not transferred from one to the other. The final sub-part of the above table labelled “in-house R&D” refers to R&D activities in the private sector that take place domestically (i.e. within Ireland) and also in the public sector such as in health and education. The table clearly shows that the most significant contributor to R&D in Ireland is R&D imported by the MNCs. It is important to note that this only has a once-off level effect on GDP. Up to this year these R&D imports where included in the national accounts (subtracting from GDP). It is only with the introduction of ESA2010 that these R&D imports are counted as part of gross fixed capital formation (adding to GDP). From now on the net or growth effect will be zero as the positive investment effect will be offset by the negative import effect. It will affect the composition of GDP though. The OECD Forum on Harmful Tax Practices (FHTP) has led work in relation to BEPS Action 5, Countering Harmful Tax Practices More Effectively, Taking into Account Transparency and Substance. Work within the FHTP has led to the development of proposals for new rules, known as the Modified Nexus approach, based on the location of the R&D expenditure incurred in developing the patent or product. This approach seeks to ensure that preferential regimes for intellectual property require substantial economic activities to be undertaken in the jurisdiction in which a preferential regime exists, by requiring tax benefits to be connected directly to R&D expenditures. One source of R&D expenditure is domestic or “in-house” R&D activity. Unfortunately, national accounts data using ESA2010 for all EU countries are not available from Eurostat. From the CSO we know that such “in-house” R&D expenditure is relatively small in Ireland. The other source is net R&D imports. This is the main contributor to R&D GFCF in Ireland. We can use Eurostat Balance of Payments data to see how much of an outlier Ireland is. In 2012, in nominal terms, Ireland had the third highest level of R&D imports, behind only Germany and France with the UK on practically the same amount. It is when you look at the figures as a proportion of GDP (albeit using the ESA95 figures which Eurostat provides) that we can see just how much of an outlier Ireland is. These expenditures are equivalent to around 3 per cent of Irish GDP. Finland is the only other country with a level above 1 per cent of GDP. If the R&D expenditure from Ireland is counted as “qualifying expenditure” for these patent boxes then the ‘knowledge development box’ announced in the budget has the potential to be a significant component of Ireland’s Corporation Tax regime – whether this is positive or negative depends on one’s position of the issue. However, this is only one part of the potential of this scheme. Thus far we have looked at the R&D expenditure that currently takes place here. There is also the R&D expenditure that might take place here. We know MNCs do not generate their IP here but they do exploit it here. The largest payments from Ireland for IP are not R&D cost-sharing expenditures but patent royalties. When it comes to these in a European context Ireland is off the chart. In Ireland these outbound payments are the equivalent of almost 20 per cent of GDP. The next highest is the Netherlands but the figure is less than 3 per cent of GDP. Why are these significant in terms of a ‘knowledge development box’ when these are payments for the use of IP not its development? These payments are made to companies which own the intellectual property. In many cases these will be Irish-registered companies (though heretofore non-resident for tax purposes). This is the two Irish company structure in the “double-irish”. The big change for these two-tier structure is not the proposed changes to Irish residency rules. That will have little impact. The big issue are the moves as part of the OECD’s BEPS project to align profits with substance, particularly employment. At the moment many of the (particularly US) MNCs operating in Ireland have their profit-generating IP assets located in Caribbean Islands where they have little more than brass-plate operations. If the BEPS proposals come to fruition the ability of companies to declare profits in locations where they have little or no real substance will be reduced. In the case of IP, substance will be judged on the basis of DEMP – developing, enhancing, maintaining or protecting the IP assets. First, they could move their staff involved in the DEMP of their IP assets to these Caribbean Islands to continue to avail of the low tax rates. Given the lack of infrastructure in these locations this is unlikely. Second, the companies could move the assets to where their DEMP staff are currently located. For US companies, this is the US. If the 35 per cent federal corporate income tax rate remains moving the assets to the US is unlikely. Thirdly, the companies could move both the assets and some of the key DEMP staff to another country that makes itself attractive to both. It is through this option that Ireland has a massive advantage that cannot be replicated by other countries – regardless of how attractive their patent box is. The advantage Ireland has is that the IP of many US MNCs is already vested in Irish-registered companies. The MNCs do not want to be transferring their assets between companies as this could potentially trigger tax liabilities and administering the changes consumes significant time and resources. They will want to restructure in the most tax-efficient and straightforward manner possible. One of the ways to achieve this is to move the location of the IP assets but not to change the ownership of them. It is also the case that for many US MNCs, these Irish-registered IP holding companies have entered cost-sharing agreements with the US parent to gain the rights to the MNCs IP. Keeping the IP in the same company means that the cost-sharing agreement can be continued. These agreements lead to R&D expenditures discussed above which will come from Ireland if the company relocates here (and possibly making the profits eligible for Ireland’s ‘knowledge development box’). The changes announced to Ireland’s residency rules have a grandfathering period where they won’t apply to existing companies for a period of six years. Ostensibly this was done to allow companies the time to restructure their operations. In actuality this grandfathering period is to ensure that the companies don’t change anything – at least until Ireland’s ‘knowledge development box’ is in place. Six years gives more than enough time for the OECD and EU discussions on patent boxes to be concluded and allow Ireland the time to legislate for a “best in class” version. The intention is that US MNCs will keep their IP with Irish-registered companies (and the lead-in period to the end of the year is probably with the hope that a few more companies might do so). And the further hope is that if the BEPS proposals come to fruition the companies will choose option 3 and move their IP assets and some key IP staff to Ireland. Lots of “hope” and lots of “maybes”. The benefits may be massive or they may be nil. How do we get US MNCs to choose option 3 and to do so in Ireland? First, the tax in the ‘knowledge development box’ has to be attractive enough so that it is not worthwhile to transfer the assets out of their Irish-registered companies. A tax rate of around five per cent should achieve that. It will be pretty easy to relocate the Irish-registered companies to Ireland as they are only brass-plate operations so a few board meetings with appropriate decision-making agendas will achieve that. Next, we need the MNCs to move some key staff associated with their IP to Ireland (assuming they are not here to begin with). This may not be as straightforward. Dublin is not London or Paris. Ireland’s Income Tax regime is very different to our Corporation Tax regime. Schemes like the Special Assignee Relief Programme (SARP) can help but are not well-received. It is just one piece of a big jigsaw and there are just too many pieces that make explaining where it fits in very difficult. Getting the necessary IP staff here will not be easy. Ireland does not have a wide or deep pool of high-quality researchers so focusing on the D and E (develop and enhance) of DEMP is unlikely to lead to much. Maybe we can achieve something on the M and P (maintain and protect) but it is not clear than any progress is being made in that direction. At present we just exploit the IP and more is required to satisfy the proposed OECD criteria. All we can say at this stage is that the ground is moving quickly. Ireland has a significant head start over similar countries trying to gain in the area of FDI. The outcome may be beneficial but there is no guarantee of that. We may find the ground moving out from under us and where will we end up is difficult to project. With so many moving parts prediction is close to impossible. The focus now is on intangibles, substance, DEMP, patent boxes and the like. That is where the game is. However, the purpose of Ireland’s Corporation Tax regime is to generate employment and maximise overall tax revenue. Just because the focus is on intangibles does not mean that is where our focus should be. The underlying primary objective has to be employment and there may not be many jobs in managing intangibles. The tax profession will argue for a ‘knowledge development box’ because there will be plenty of work for them in that. The changes to our Corporation Tax regime over the next few years have to be about more than on-shoring low-tax outcomes. Yesterday’s release by the CSO of the September Retail Sales Index shows that the increases recorded over the past year or so have stalled, and in value terms have almost fully being reversed. As per usual we focus on the RSI excluding the motor trades. In the past two months the value of retail sales has fallen 1.4 per cent with volumes falling 0.6 per cent. These are reflected in the annual changes which are still positive but the value index is now showing annual growth of just one per cent. The monthly changes highlight the volatility in the series so reading anything from changes over a two-month period is not very reliable. It is also possible that the September figures will be revised in later RSI releases. For the moment at any rate we can say that the figures are not reflective of “recovery”. What will the final quarter of the year bring? Using Eurostat here we can summarise the contribution of enterprises to the Irish economy. In 2011, Gross Value Added at factor cost was around €156.5 billion so we can see that enterprises contributed €87.8 billion (around 5/8ths) of that. The remainder would come from the household sector (the self-employed) and the government sector. The contribution of foreign-owned enterprises to the above is. The GVA from enterprises was divided between personnel costs (€37.6 billion) and gross operating surplus (€50.2 billion). GOS is a measure of profits akin to earnings before interest, tax, depreciation and amortisation (EBITDA). Looking at how much of this was contributed by the foreign-owned sector gives the following. The importance of the foreign-owned sector in Ireland is clearly visible. Here is a table that shows the percentage of each item for enterprises coming from the foreign-owned sector. In 2011, foreign-owned enterprises made up just over 2 per cent of all enterprises in Ireland but provided 22.7 per cent of the persons employed by enterprises. Foreign-owned companies accounted for 55 per cent of enterprise turnover, 34 per cent of enterprise personnel costs and 72.8 per cent of enterprise gross operating surplus (somewhat equivalent to earnings before interest, taxes, depreciation and amortisation). In 2011, Irish-owned companies generated a gross operating surplus of €13.6 billion compared to €36.5 billion from foreign-owned companies. After making adjustments for interest and depreciation there is likely to be a taxable income from the foreign-owned sector of around €30 billion with 12.5 per cent of that being €2.5 billion. Corporation Tax and financial and insurance companies and passive income not included in the above “operating” table would bring the corporation tax take from the sector to over €3 billion. The Income Tax (+USC) and PRSI collected from the €12.8 billion of personnel costs incurred by the foreign-owned sector is also likely to approach €2.5 billion. There will be further Exchequer revenues from VAT, Excise Duty and other taxes. The following four tables give a breakdown of the above for companies controlled from the US, the UK, the Euro-area and Other (i.e. non-US/UK/Euro). The figures for US-owned companies are the largest: 100,000 jobs; €6 billion of labour costs likely leading to €1 billion of Income Tax and €0.5 billion of PRSI; €2 billion of Corporation Tax; €3 billion of gross investment in tangible goods; VAT; Excise Duty, local purchases of goods and services; etc. etc. And finally here are the figures for Irish-controlled enterprises. For Irish companies 65 per cent of added value is devoted to personnel costs, compared to just 26 per cent in the foreign-owned sector (and 17 per cent for US-owned companies). Here is the submitted text for an article in last weekend’s SBP on the European Commission State-Aid investigation to Apple’s tax arrangements in Ireland. The European Commission’s investigation into Apple’s tax affairs started out as a narrow probe of a transfer pricing arrangement in place in Ireland back in 1991 but could expand into a much broader trawl through Apple’s global tax affairs. The discussions from 1991 that took place between Apple’s tax advisers and the Revenue Commissioners were reported in a damning fashion by the Commission but were short of what is required for an adverse state aid finding to be made. It seems the Commission investigation are motivated to make an adverse finding against Ireland and have thrown a wide net over Apple’s management of its intangible assets. However, like their examination of the 1991 agreement the Commission are unlikely to come up with much to interest them. The key to Apple’s profitability are its brand and innovations. Lots of companies can make smartphones and other consumer devices but none command the customer loyalty Apple has engendered or the reputation it is fostered. The Apple brand is a massively valuable asset and much of Apple’s profit is rightfully attributed to it. Apple has divided the economic rights to into two divisions. On one side you have the Americas, with Apple declaring its profits to the Internal Revenue Service in the US and paying tax accordingly. On the other side there are the global rights to Apple’s intangibles and that is where the story gets interesting. As was revealed by a US Senate investigation in May 2013 these hugely valuable intangible assets are held in Irish-incorporated subsidiaries of Apple. However, apart from some Irish Corporation Tax paid on the profits of the activities of their branches in Ireland these subsidiaries paid no other corporate income tax anywhere in the world. This was achieved by being “stateless” for tax purposes which was the result of not being tax resident anywhere. Apple engineered this by falling between gaps in the interaction of Irish and US tax law. Of course, a company that is “stateless” for tax purposes has to be somewhere in reality. The question the European Commission wants answered is where are these companies. If they are in the US it is not an issue for Ireland but if these companies are carrying out their operations in Ireland how come they are not paying Corporation Tax to Ireland on the massive profits earned. There was lots finger-pointing at Ireland following the US Senate hearing but the reality is that these “stateless” Apple subsidiaries carry out their activities in the US and therefore their profits are not subject to Irish tax. In his opening statement to the Senate hearing when talking about these companies, the committee chairmen Sen. Carl Levin said that “these companies’ decision makers, board meetings, assets, asset managers, and key accounting records are all in the United States.” In a sense the European Commission have asked the Irish government to prove this. A problem faced by the government is that they need Apple’s help to do so. It was easy for the government to provide the information on the 1991 agreement because the Revenue Commissioners had it all but how do they get information about Apple’s activities in the US unless the company provides it? From an outsider’s perspective we can try to find evidence of these companies in Irish economic statistics, most notably the balance of payments which records international transactions. The scale of Apple’s financial flows means they should be fairly easy to identify in Irish statistics. In 2011, the key Apple subsidiary in question made payments of $1.4 billion to the parent company as part of the agreement to use Apple’s intangible assets outside the Americas. In that year this company had sales revenue of $48 billion and a profit of $22 billion. If these massive financial transaction were happening in Ireland they should be easy to identify in Ireland’s economic statistics. We know that Google does have its international sales running through Ireland and the effect of these on Irish economic statistics can be identified. In 2013, Google’s non-US revenue was €17 billion which is much lower than Apple’s. It is also the case that Apple’s revenues are growing rapidly. The subsidiary the Commission are focussing on had revenues of $48 billion in 2011 which in 2012 had grown to $64 billion and this rapid growth has continued. Figures in the Irish data do not show these increases. A useful check to make would be to see if these flows appear in US balance of payments data. Apple may be one of the biggest companies in the world but the US remains the biggest economy in the world and identifying the impact of a single company in US statistics is impossible. We can check flows by country and there is nothing in the US data to suggest that Apple is routing its revenues through Ireland. A possibility is that the investigations into these “stateless” companies has revealed huge gaps in the international tax law but also a massive black hole in balance of payments data. The profit from Apple’s sales around the world flow directly to the US just as Sen. Carl Levin said last year. Unlike Google there is no stop-off in Ireland to indicate that the application of Irish Corporation Tax to these profits is warranted. The profits are in the US and it is US rules that allows them to go untaxed until they are transferred from the subsidiary to the parent. It is not clear how the Commission investigation will proceed from here. Apple may not have been pleased but, as a US company, they were obliged to provide information to the US Senate on their US activities. There is no such obligation for them to tell the European Commission about their activities in the US and the Irish government cannot provide information that they do not have. The Commission are shaking the Apple tree but nothing is going to fall out of it. Rather than being objective it seems they will be disappointed by that. Irish-registered companies have to be audited in Ireland. Irish-registered companies must maintain their financial accounts in Ireland. The European Court of Justice has ruled that a company’s main centre of interest is in the country of registration. The Auditor can reside anywhere in the world but must have a ARN (auditors registered number), these are obtained from the accounting governing bodies of UK and Republic of Ireland. Accounts can be prepared and signed anywhere, it is the submission to CRO and storage that is relevant. the presumption … whereby the centre of main interests of that subsidiary is situated in the Member State where its registered office is situated, can be rebutted only if factors which are both objective and ascertainable by third parties enable it to be established that an actual situation exists which is different from that which location at that registered office is deemed to reflect. That could be so in particular in the case of a company not carrying out any business in the territory of the Member State in which its registered office is situated. This clearly states that the centre of main interests and country of registration do not have to be the same but if they are to be different then clear and objective facts are required in order to show that they are different. Unsurprisingly, the debate focussed a lot on Apple (it is after all one of the few companies we have detailed knowledge about as a result of the US Senate Report and the recent EC State-Aid letter to Ireland). Apple has Irish-registered companies at the centre of its global tax structure. Prior to 2012, ASI, like AOI, had no employees and carried out its operations through the action of a U.S.-based board of directors, most of whom were Apple Inc. employees in California. Of ASI’s 33 board meetings from May 2006 to March 2012, all 33 took place in Cupertino. In short, these companies’ decision makers, board meetings, assets, asset managers, and key accounting records are all in the United States. Their activities are entirely controlled by Apple Inc. in the United States. AOI’s board meetings have almost always taken place in the United States where the two California board members reside. According to minutes from those board meetings, from May of 2006 through the end of 2012, AOI held 33 board of directors meetings, 32 of which took place in Cupertino, California. AOI’s lone Irish-resident director, Ms. Kearney, participated in just 7 of those meetings, 6 by telephone. For a six-year period lasting from September 2006 to August 2012, Ms. Kearney did not participate in any of the 18 AOI board meetings. AOI board meeting notes are taken by Mr. Levoff, who works in California, and sent to the law offices of AOI’s outside counsel in Ireland, which prepares the formal minutes. Apple told the Subcommittee that AOI’s assets are managed by employees at an Apple Inc. subsidiary, Braeburn Capital, which is located in Nevada. Apple indicated that the assets themselves are held in bank accounts in New York. Apple also indicated that AOI’s general ledger – its primary accounting record – is maintained at Apple’s U.S. shared service center in Austin, Texas. Apple indicated that no AOI bank accounts or management personnel are located in Ireland. Did Apple reveal that it is breaking Irish company law by saying that its primary accounting record is maintained in Austin, Texas? No, it is the suggestion that Irish-registered companies must maintain their financial accounts in Ireland that is wrong. Apple is a massively profitable company but the suggestion that the company’s 4,000 employees in Cork are responsible for generating those profits is nonsense. Apple is profitable because it designs a phone that people want to buy and has developed a brand that people are extremely loyal to. Neither of these are the result of the activities of Apple’s Cork employees. The intellectual property is vested in California. There is nothing to suggest that this is not the case. In The Irish Times today there is an article that compares some measures of poverty in Ireland to the EU average. It makes a meal of it. There is a large amount of poverty in Ireland but it would help if it was described accurately. This piece features this confusing chart. This survey will be conducted throughout the European Union as the European Council and the Commission has given high priority to fight against poverty and social exclusion. The European Union requires comparable and timely statistics to monitor this process. The difference between the left and right panels is not differences in definitions; it is because the data used represent different things. They are different because they are different. The panel on the left has data on “at-risk-of-poverty or social exclusion” while the panel on the right just relates to “at-risk-of-poverty”. It is the inclusion of measures of social exclusion in the data used the left panel that results in the difference not any inconsistency in how poverty is measured. We have looked at this measure of “at-risk-of-poverty or social exclusion” before (see here) and discussed some of the reasons why Ireland fares very badly under this metric. Some of the points made there are important in the context of the article published by The Irish Times today but rather than make them again here are a few additional ones. This is a table a piece comparing at-risk-of-poverty rates in Ireland and the EU should use. It shows proportion of the population who have an equivalised disposable income of less than 60 per cent of the median. This is the standard definition of “at-risk-of-poverty”. 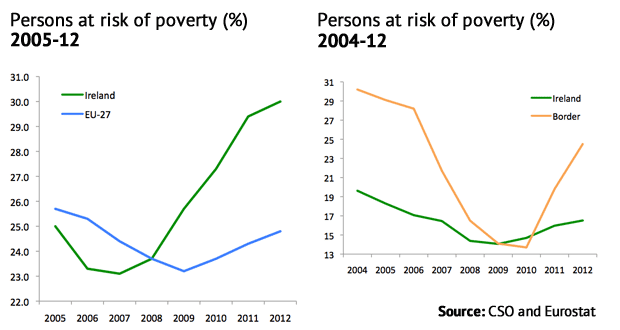 Ireland’s at-risk-of-poverty rate is below the EU average and has not deteriorated significantly during the crisis. Yes, it is a relative measure but that is how it is done. Further, here is a related table from Eurostat that tells an important story. Ireland’s at-risk-of-poverty rate in 2012 was below both the EU28 and EA17 average which were both at 17.0 per cent. What is notable is that Ireland has the HIGHEST at-risk-of-poverty rate in the EU before social transfers are included. This is disposable income before receipt of all social transfers except pensions (public and private). This is mainly primary or market income. Ireland has the most unequal distribution of market income in the EU. Ireland is not just above the EU average we are above the next highest country by some distance. Ireland is 39.3 per cent; the second highest country is the UK at 30.5 per cent; the EU28 average is 26.3 per cent. Ireland would be considered an extreme outlier. Introducing a wealth tax and increasing transfer payments will not fix this. Ireland has the most successful tax and transfer system at reducing poverty in the EA. It brings us from worst in class to below the EU average. When looking at at-risk-of-poverty rates in Ireland the stand-out feature is not the headline rate. That is below the EU average and is lower than it was from 2003 to 2007. The standout feature from the EU-SILC about Ireland is this. As we have said before, Ireland is almost “off the scales” and is more than 2.5 times the EU average. Maybe we should try and fix this. Not a word about that today’s article though. The ruling we are looking at concerns Amazon's subsidiary in Luxembourg, which records most of the group's European profits. This company pays a royalty to another entity based in Luxembourg, but not subject to corporate taxation in Luxembourg. Today we observe that through this mechanism most European profits of Amazon are recorded in Luxembourg but are not taxed there. The terms for calculating this royalty are essential. These transfer pricing arrangements are set out in the ruling of 2003 that is the focus of this investigation. At this stage we consider that the amount of this royalty, which has lowered the taxable profits of Amazon, might not be in line with market conditions. So we have a trading company operating in Luxembourg that records the sales made by Amazon from across the EU - these number in the millions and thus accumulate a large profit. But then the trading company makes a royalty payment to another Luxembourg-registered company but one that is not subject to tax in Luxembourg. Thus the payments to the holding company are not taxable in Luxembourg. These payments will be for the right to use the intangible assets (brand, technologies etc.) that Amazon has developed. A good description of Amazon’s tax structure is in this 2012 article from Reuters, which has now being confirmed by the EU Commission. This is very similar to the structure used by Google in Ireland. Google has a trading company here that books almost all of Google’s advertising sales revenue outside the US. This trading company makes a royalty payment to a non-resident Irish company which is “managed and controlled” in Bermuda. This is an intangible asset holding company. A more complete description was provided in a recent IMF Fiscal Monitor (see page 47). Amazon are essentially engaging in a “double-irish” but doing so in Luxembourg. The European Commission is not investigating the overall nature of the structure, i.e. the two companies can comprise the “double” because that complies with existing tax laws. The Commission is investigating the size of the royalty paid by the trading company to the holding company that has the intangible assets. The question the Commission is setting is whether enough profit is declared by the trading company not whether the overall structure is illegal. Of course, the whole point of using two companies incorporated in the same country (whether it is Ireland or Luxembourg or any country) is to avail of the “same-country exemption” in the US tax code. The US taxes US companies on their worldwide income is Amazon, Google and the like are subject to the 35% US corporate income tax on their worldwide profits. However, using the “same-country exemption” they can engineer a deferral on the payment of this US tax until the profit is repatriated to the US, if ever. Google does it using two companies in Ireland; Amazon does it using two companies in Luxembourg and there are likely to be many other examples. There is nothing Ireland or Luxembourg can do about the “same-country exemption” in US tax law. The OECD is proposing to reduce the effectiveness of these schemes but trying to more forcibly link the location of profits with substance. At present, these companies can locate the intangible assets in holding companies based in low- or no-tax jurisdictions such as Caribbean Island where there have little more than a brass-plate operation. the intangible assets. If a company does not engage in DEMP activities it cannot claim entitlement to the profits from holding the intangible assets. The profits must be linked to the DEMP substance. At present these companies do not engage in DEMP activities in small Caribbean Islands but are locating they profit from their intangibles there. The companies are benefitting from the zero taxation that these jurisdictions offer and they are using the “same-country exemption” to defer the US tax that is due on this assets. Both the European Commission, and more importantly, the OECD are examining this issue. However, they are not questioning the “two-company structure”; they are looking into the transfer pricing agreements between the companies. The European Commission are questioning whether more profit should be declared by the trading company while the OECD are proposing that the profit declared by the company holding the intangible asset must be linked to the substance behind the intangible asset. If the OECD’s proposals come to the fruition they are likely to have a far greater effect. Neither the Commission or the OECD have any jurisdiction over the “same-country exemption” in US tax law. Nor over the “look-through rule” and “check-the-box” which can equally be used to engineer a deferral of US corporate income tax for US companies on their non-US profits. There is nothing illegal or probably even questionable about the two company structure at the heart of the “double-irish”. What we learned today is that Amazon has a similar two-company structure in place in Luxembourg. But the “double-luxembourger” doesn’t have the same ring to it.